It’s a significant event when the world outside can be brought closer through the magnifying power of binoculars, but it is a bigger deal than that for me. See, those binoculars belonged to my dad. I know with one hundred per cent certainty that he has no idea that we have them, and I have to keep convincing myself that he would have no problem with the fact that we are putting them to use. I know in my heart of hearts that if I hadn’t taken them out of a small box of my dad’s belongings, they would likely have been lost years ago. I snatched them, with other nostalgic items, when I helped my uncles to clean out one of the apartments that my dad left behind. Through the years, he has left other apartments behind, other boxes of belongings. Some of the boxes were saved by family members, but I know that other boxes of things have likely been lost forever. 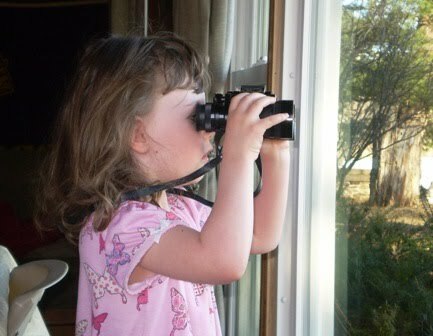 I knew then, what I know now: that my dad has no real need for binoculars,(or the chess board that I am using to teach my kids how to play) but that doesn’t make the recent use of those things any easier. I couldn’t tell you the last time he used the binoculars. I only remember how he used to use them when I was a kid. My dad would take them to Broncos and CU Buffalo football games. I remember the black electrical tape that still holds the case together, and I can picture his younger, stronger hands opening the case to let me hold them…and look through them. I wanted to see what only the binoculars could show me. I worked at getting the two separate circles to join together so that what I was aiming at could be singularly focused. I couldn’t do it very well as a kid, but it worked flawlessly for me this weekend. So much has changed since my initial attempts with those binoculars. Well, for starters, I was the one sharing them with my own kids this weekend. My dad has been lost…and then found…and then lost…and then found again…over and over. I took the binoculars from him thinking I would just protect them for him for a while. He has not yet given me a reason to give them back. I wish more than anything he would call me up, screaming, that he wants them and that he has a million things he wants to do with them. I know that that is never going to happen. No one knows where he is right now. So, I emotionally cheer on my kids when they get the binoculars to work and something glorious gets bigger for them. Those binoculars are safely shelved at our cabin right now, but I will likely bring them with us when we go to Colorado for part of this summer. There is a lot to look at there too. Also, if, by chance, no one has been able to find my dad by then, maybe I can station myself at a possible stomping ground and just look through those lenses for him. Maybe he could come into focus…just one more time. I’d love to see him again…even if it is on his terms. I want to thank him. I want to thank him for the memories my family was able to make this weekend looking through those stolen binoculars. I want to thank him for the genes he contributed to help make our great kids with whom I get to share my life, and I want to tell him that there is still so much in the world worth looking at. You have such an incredible way of making all these fond memories come to life! Thank you for sharing these with the world. My dear Meagan, Your beautiful thoughts make me realize what a great God given talent you have at putting words together that are so meaningful. Love, Grandma "B"
What a beautiful post. You have such a way with words. You say so much, but leave us wondering. You turn what sounds like a sad situation into a positive. Thanks for linking up and sharing this post. As always, I look forward to your next post. Wow, Meagan. That was beautifully written. And I pray that some how, some way, you are able to share all these things with him. Hi Meagan, you used to follow me on gracenotes95! Glad you found me again! That was very beautiful, Meagan. Thank you for sharing!